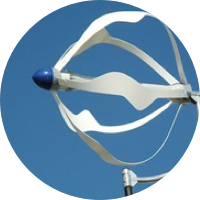 The Energy Ball® begins operating at very low wind speed of only 2 meters per second (i.e. very sensible), whereas studies showed according to The Energy Commission (EC) of Ghana that in most region in Africa and particularly in Accra, Ghana plains, the wind speed average 5.5 to 6.5 meters per second compared to the Ghana-Togo border where the wind speed can be as high as 9 meters per second. Another study done in July 2003 by the Solar and Wind Energy Resource Assessment (SWERA) presented by the Department of Mechanical Engineering School of Engineering and submitted to the Energy Commission (EC) of Ghana also confirmed the high wind speed in Ghana.